I am using 2 ASN.1 files pkcs-1.asn and pkcs-8.asn from the PKCS standards which both define the same modules. Can I specify the same package name for both? For example, suppose the package name is com.name.pkcs . I compiled these 2 files separately and I got two similar files in the same package. Is there an example that would demonstrate automatic encoding and decoding of OpenType values as well as manual encoding and decoding? Is there an example that illustrates using automatic and manual encoding/decoding of PDU objects with OpenType values? I have a SEQUENCE type that refers to an Information Object Set. When I decode a value of this type, how do I determine the type of the OpenType using the OSS ASN.1 Tools for Java? When using the OSS ASN.1 Java compiler to generate Java code, is there any way I can separate the Java files into two packages, instead of one module package? I have multiple modules and I am confused about why most of the modules generated from myspec.asn by the OSS ASN.1/Java compiler are empty. Do you have an example that demonstrates encoding to a file and decoding from a file? When decoding concatenated PDUs from a file, is it possible to know which one is invalid and then skip that particular PDU? Is there an example that illustrates how to decode all but one component of a SEQUENCE or SET? Is there an example that illustrates use of the DeferDecoding ASN.1 compiler directive? How can I get rid of the tracing information that is printed when the Java Runtime runs? Encoding of my Java class object which contains an ANY type works without any problem. But when I decode, the ANY value is still encoded. Why? Is there an example that illustrates how to use types with extensibility and values with unknown extension additions? Is there an example that illustrates the "RelaySafe" Mechanism? Do I have to use setXXX() methods to set values if the values are already set in my .asn file? When I run "asn1pjav -test myexample.asn" , I do not get a Test.java file. Why is that? When I try to compile the generated Java files for the test example that OSS provides, I get a compile error. I am getting a ClassFormatError when running the JDK. Why is this happening and what can I do to resolve it? Is there an example that would demonstrate the multi-threading feature of the OSS ASN.1 Tools for Java? I am trying to run the BER Coder through a thread. My code works fine if I do not run it within a thread or if I take the getBERCoder() call out of the thread. Why? Is there an example that illustrates how to use Information Object Sets generated by the ASN.1 compiler? I can construct an instance of the generated Java class which contains an OpenType value without any problem and isValid() returns "true", But it throws an EncodeFailedException when I try to encode it. The error message is: E0090E: Length of encoded data of OpenType is 0; check field 'content' (type: OpenType) of field 'contentInfo' (type: ContentInfo) of PDU 'PInitRes'. Is there an example that illustrates how to manipulate values of NumericString, OCTET STRING, SET OF, SEQUENCE, VisibleString, INTEGER, SET, CHOICE, BOOLEAN, OBJECT IDENTIFIER, and GeneralizedTime? Do you have a sample that handles a large SEQUENCE OF while avoiding intermediate disk input and output? Do you have a sample that shows how to decode a value of EXTERNAL, and its 'encoding' field? Do you have a sample that shows support for Distinguished Encoding Rules (DER), not just Basic Encoding Rules (BER) in disguise? Do you have a sample that demonstrates Contents Constraints (or how to encode and decode BIT STRINGS and OCTET STRINGS with Encoding Rules that are not ASN.1)? Do you have a sample that demonstrates how to override a compiler generated class via the UserClass ASN.1 compiler directive? 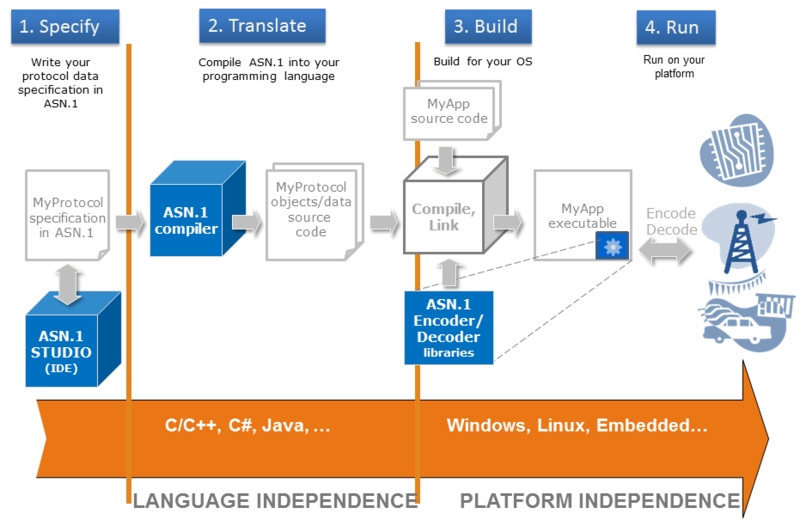 Do you have a sample that demonstrates use of the ASN.1 compiler -test option? What are the limitations of the ASN.1 INTEGER type? What is the value of MAX that appears in some ASN.1 definitions? How can I indicate that an ASN.1 INTEGER value may be large? We want to test that the decoder works with values that are incorrect, but the OSS ASN.1 Java compiler is so good that it is giving errors for the bad values. What can we do? Is there a way to check for the tag of the PDU? I see that in the some of the generated files, there is a function: public TypeInfo getTypeInfo(). Can you give me information on this method? Do you have a sample that illustrates the protocols ROS+H4501+H323+H235+H225 for the OSS ASN.1/Java tools? Why am I getting this Exception message when I run the sample program: Exception in thread "main" java.lang.NoClassDefFoundError? Does the sink parameter of the decode() method and the return value have to be instances of the same class? Why am I having problems printing? The results look like this: Output from decoder number 0: Test.DataRecord@0? I would like to create a generic encode() method which would create the Coder instance before calling encode . How can I do this? Do you have a sample application that illustrates step-by-step the use of the OSS ASN.1/Java Compiler to compile a simple ASN.1 module, and the use of the OSS Java API to invoke the encoder/decoder? Do you have an example that illustrates how to work with TBCD Strings using the ASN.1/Java runtime? Why does the ASN.1 Java Compiler generate filenames longer than 255 characters? The javac compiler will not accept them.